The Vancouver Condo Buzz » From $199,900! Handcrafted West Coquitlam Regan’s Walk Condos by Marcon > 71 Homes with 1 – 3 Bedroom Floor Plans in Burquitlam! From $199,900! Handcrafted West Coquitlam Regan’s Walk Condos by Marcon > 71 Homes with 1 – 3 Bedroom Floor Plans in Burquitlam! Launching this Fall! Beautiful new West Coquitlam condos for sale from just $199,900! 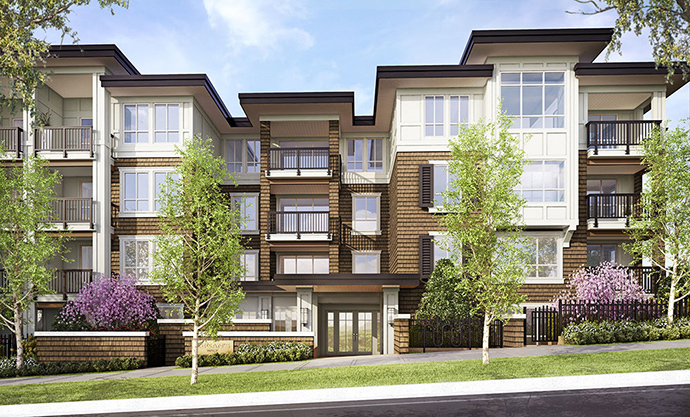 Regan’s Walk is a condominium project by Marcon builders and it is situated in the walkable West Coquitlam real estate district (also known as Burquitlam). The project will only feature 71 boutique residences (between 1 to 3 bedrooms) with forward thinking design and smart features that come standard in every home. Some of the highlights at West Coquitlam Regan’s Walk condos include nine foot ceiling heights and large expansive windows that allow an abundance of natural light into your home. As well, the Regan’s Walk Coquitlam condos will have a stainless steel appliance package with a counter depth Fisher Paykel fridge/freezer. Most of the homes will also come with full height pantry complete with a built in microwave and a USB charging station! Other initial features of the new West Coquitlam Regan’s Walk condos includes spacious master bedrooms of which most will fit king sized beds. As well, the spa inspired bathrooms will include thoughtfully designed vanity for extra storage and under cabinet LED lighting for those truly impressive details. Not only that, but Marcon has priced these well below any other project in the Burquitlam real estate market. 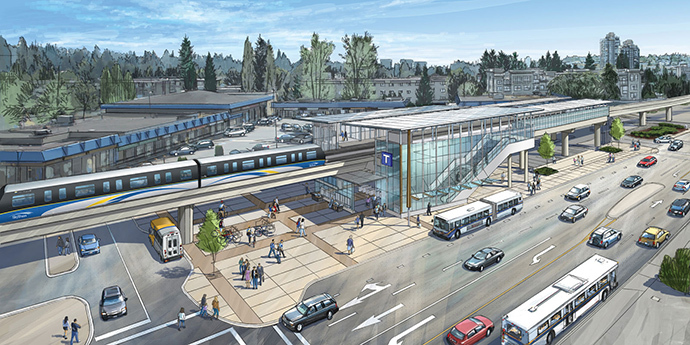 As well, the West Coquitlam neighbourhood is very close to the Evergreen SkyTrain Line, making it one of the very best transit oriented communities in Greater Vancouver. And yes, that’s correct, the Regan’s Walk Coquitlam condos start from just $199,900. For more information, please visit www.reganswalk.ca to register you interest today! Again, previews and presales should start early Fall, so don’t miss out on this great opportunity, especially for first time homebuyers who can lock in a great mortgage rate before they start rising! VIP PREVIEW EVENT at Regan’s Walk Coquitlam Apartments! The VIP preview event at the newest West Coquitlam real estate development at Regan’s Walk apartments is coming soon! The date is set for September 21st between noon and 5pm. Join them to preview Regan’s Walk Coquitlam with 71 handcrafted 1 to 3 bedroom condos in a walkable neighbourhood. The sales centre is located at 408 – 552 Clarke Drive in Burquitlam Plaza in Coquitlam. Some of the incredible features of these new West Coquitlam homes for sale include contemporary interiors by Gannon Ross Designs with 2 colour palettes to choose from. All homes have 9 foot ceilings as per plan as well as panoramic Smart Glass LowE2 windows and sleek two inch faux wood blinds for added privacy. As well, the homes will have Whirlpool Duet full sized stacked front loading Energy Star rated washer and six cycle dryer in addition to decora style rocker light switches and flat panel interior doors. There are built in USB charging station in the stone counters in select homes as well as modern scrolled level loop nylon carpets in the bedrooms for the cozy feel. The master bedrooms also are spacious and the homes have contemporary style baseboards and door trim. As well, the West Coquitlam Regan’s Walk condos have premium laminate wood floors (wide plank) and acoustic underway between floors to reduce sound transfer. The bathrooms will have Euro white shaker cabinetry with soft close hardware and super white solid quartz stone counters. There is a Classic Collection deep soaker tub in addition to full height tiled tub and shower surround. The tiled floors are of the Limestone Series in Sand or Malt and the vanities are large. There are rectangular under mount sink with unique tapered bowl in addition to a Moen polished chrome bath and shower collection rain shower head, single lever faucet in second bath and 2 handle widespread faucet in the ensuite. There is forged steel framed mirror and brushed steel accent light bar as well as Chelini Collection Marbella dual flush elongated water closets. The bathroom accessories are selected from the Infinity Collection. The kitchens at the presale Coquitlam Regan’s Walk condos include lazy susan rotatin trays, brushed nickel track lighting with LED under cabinetry strip lights and in sink garburator. As well, the homes will have a sleek, polished chrome, single control faucet with integral pullout sprayer by Moen in addition to Sonetto Euro style double bowl stainless steel under mount sink. There are rich super white solid quartz stone counters and full height hand set tiled backsplash. The pantries allow for lots of extra storage space and the new Regan’s Walk West Coquitlam apartments will also feature distinctive thermafoil cabinetry with shaker 42” uppers. The premium stainless steel appliance set at Regan’s Walk Condos in West Coquitlam real estate market includes a Fisher & Paykel Active Smart counter depth fridge with bottom freezer, internal water filtration system, built in ice maker and water dispenser in addition to a Whirlpool self cleaning electric slide in range with ceramic glass CleanTop and Accubake functions. There’s also a Whirlpool Gold Series Energy Star six cycle dish washer that if fully integrated in addition to a Venmar Jazz urban chimney hood fan. The one bedroom floor plans include Layout A (509 square feet) and D (580 square feet). 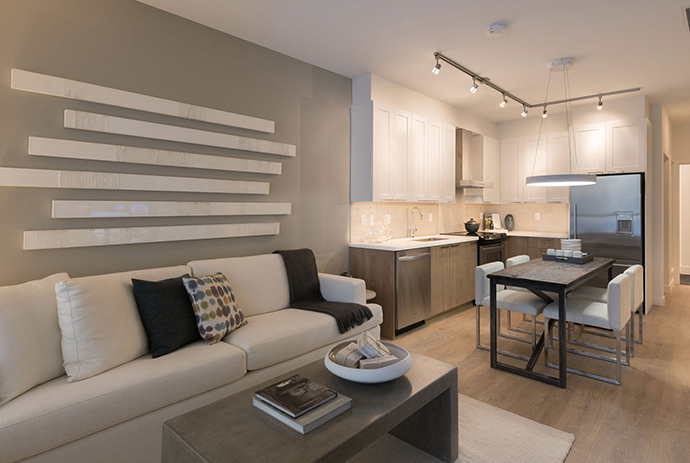 The spacious 1 bedroom + den layouts at Regan’s Walk Coquitlam includes Plan C (629 sqft) and E1 (708 square feet). The 2 bedroom units include Plan F (870-876 sqft) and G (876-893 sqft). The family sized two bedroom plus den West Coquitlam condo floor plans include Layout H (1079-1102 sqft), Plan I (1080-1104 sqft) and J (1101-1125 square feet). A Step Ahead – Coquitlam Regan’s Walk from $199,900! One of the best features of the contemporary homes at Regan’s Walk condos in West Coquitlam property market is the fact that they are just steps away from the new Evergreen Line Skytrain station that will be launching in a couple of years. In addition, many shops, dining options, services, schools and other transit routes are just outside your door. The West Coquitlam Regan’s Walk apartments are nestled on Regan Avenue just one block south of Como Lake Avenue and two blocks East of Clarke Road – just steps to the new Burquitlam Skytrain Station. This new Marcon community consists of 71 homes ranging from one bedroom to three bedroom plus den plans. Regan’s Walk is nestled on Regan Avenue just one block south of Como Lake Avenue and two blocks East of Clarke Road – just steps to the new Burquitlam Skytrain Station. This new Marcon community consists of 71 homes ranging from one bedroom to three bedroom plus den plans. Located in the heart of West Coquitlam Regan’s Walk condos for sale will be a short stroll away from the new Evergreen SkyTrain Line, urban parks, top ranked schools and easy access to downtown Vancouver. Built by Marcon Regan’s Walk Coquitlam condos features a four storey apartment building offering only 71 boutique residences with floor plans that range between 1 and 3 bedrooms. Bright, contemporary interiors with upscale, urban finishings are included in every home. 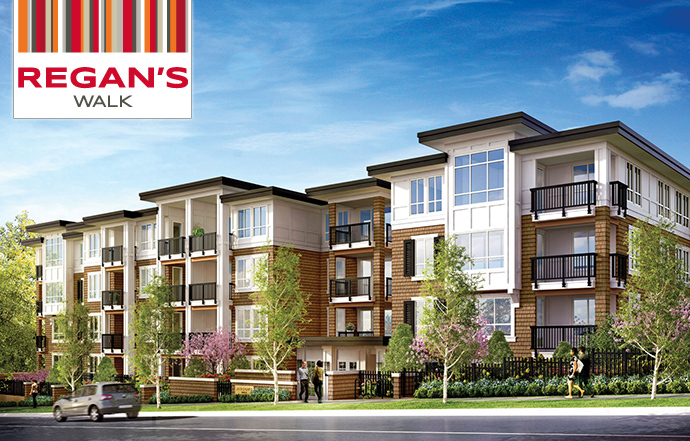 The new Burquitlam Regan’s Walk condos will begin construction in Fall 2013.